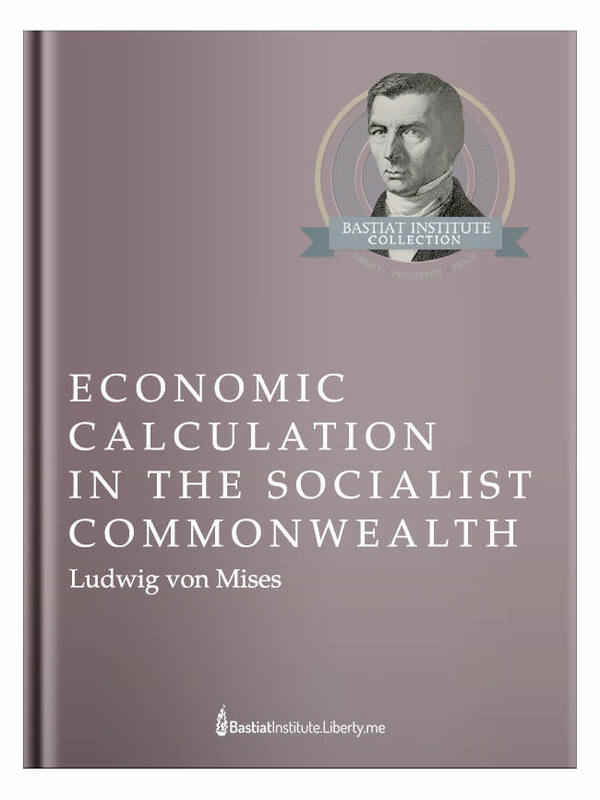 Economic Calculation in the Socialist Commonwealth is the definitive case against Socialism. In 1920 Ludwig von Mises was alone in challenging the socialists to explain how their economic system would work in practice. Mises proved that socialism would never work because it did not allow for economic calculation to take place. Since there was no free market, the State owns the means of production, a pricing system couldn’t arise. Without prices, there can be no rational economic calculation. What products should be produced and in what quantity? Where should the production take place? Which raw resources should be used and how sparingly? Are our processes efficient? These are questions no central economic planning board can decide without a proper pricing system. Without prices, the decisions of the central planners become arbitrary and chaotic and detached from reality. Mises’ critique delivers a “”death-blow”” to the supporters of Socialist policies. Any serious student of economics should study this work. When he wasn’t laying the foundations of the Austrian school of economics or predicting the Great Depression, the greatest economist of the 20th century, Ludwig von Mises, was demolishing the concept that was sweeping the world: Socialism. Join Jeffrey Tucker to discuss Mises’s powerful and in-depth discussion of Socialism Sunday, September 7th at 8pm EDT! Presented by the Bastiat Institute One of the most important contributions made by Ludwig von Mises was his elucidation of the “socialist calculation problem,” which shows that central planners, robbed of the price mechanism of a free economy and the information it carries, cannot correctly choose what should be produced in society. On the other hand, in a free society, this function is taken care of by market processes and requires no planner. In this three-part course, Prof. G.P. Manish will show the theory behind the calculation problem and then show its effects in the real world as shown through the outcome of India’s socialist policies. Session #1 of this course will seek to lay the foundations for understanding the problem by delving into the problems with the value theory of the Classical economists and the innovations of the Austrian theory of subjective value put forth by Carl Menger. An explanation of marginal utility will help to link these concepts to choice and show how we can use these concepts to better explain and understand human action. Join G.P. Manish to explore this problem and gain a better understanding for yourself of the economic problems with socialism Monday, September 22nd at 8pm EDT, only on Liberty.me LIVE! One of the most important contributions made by Ludwig von Mises was his elucidation of the “socialist calculation problem,” which shows that central planners, robbed of the price mechanism of a free economy and the information it carries, cannot correctly choose what should be produced in society. On the other hand, in a free society, this function is taken care of by market processes and requires no planner. In this three-part course, Prof. G.P. Manish will show the theory behind the calculation problem and then show its effects in the real world as shown through the outcome of India’s socialist policies. This third session will focus on applying the problem of economic calculation to real-world policies of India’s most socialist period. Prof. Manish will show how these disastrous policies hamstrung the Indian economy, and show how a free market can overcome these issues to maximize human flourishing. Join G.P. Manish Thursday, October 9th at 8pm ET for the conclusion of this series only on Liberty.me LIVE!